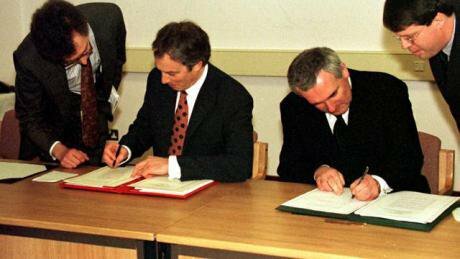 Tony Blair and Bertie Ahern sign the Belfast Agreement. Image, BBC, fair use. Northern Ireland basked in international media attention in the 1990s, with its ‘peace process’ bracketed with those in Israel/Palestine and South Africa as carrying global political significance. An ‘historic’ agreement on Good Friday 1998 brought a forest of media satellite vans once more to encircle the Stormont estate. Yet as the 1993 Oslo accords bequeathed to still-dominated Palestinians broken-backed, divided enclaves and the end of apartheid in South Africa in 1994 saw its vast ethnic inequality yawn still wider, Northern Ireland faded back into a familiar history of sectarian polarisation, and the spotlight turned elsewhere. May had called the snap election to strengthen—she thought—her mandate to pursue ‘Brexit’, after the narrow vote in favour of the UK leaving the European Union in the referendum a year earlier, which had dislodged her predecessor as Tory leader, David Cameron, from power and office. The result was however to return the focus to what Winston Churchill, in government when Britain partitioned Ireland in 1920-22, resentfully called ‘the dreary steeples of Fermanagh and Tyrone’, counties abutting what then became the UK’s new border. Ireland had barely entered the heads of the Brexit enthusiasts. Cameron was evidently blithely unaware of how an EU referendum would simply add another charge to the sectarian divide. There was a majority for Remain in Northern Ireland but only because what might be called an alliance of Catholics and/or cosmopolitans prevailed over the conservative communalists within the Protestant community: those who self-defined as ‘unionist’ were even more likely, according to one poll, to vote Leave than voters on the other side of the Irish Sea. While Sinn Féin failed to mobilise for Remain—its 1970s Euroscepticism hangover mirroring that of Labour’s current leader and its long-time ally, Jeremy Corbyn—and the (slightly) more conciliatory Ulster Unionist Party was divided on Brexit, the DUP was ideologically gung-ho, willingly acting as a conduit for dark money flowing into the Brexit campaign. Fast forward to today: Remain is now leading by ten points in the latest poll in Britain, there is still no devolved government at Stormont and the Brexiters find themselves unwillingly dragged into an Irish bog which they can neither fathom nor escape. True, the discomfiture is not only theirs: Corbyn, turned mute on Brexit and attempting to trample the growing demand within his party for a commission to review its policy, finds himself in an indefensible position—on the one hand supporting not just an invisible border but an end to partition in Ireland, while on the other endorsing not just a soft but a total Brexit, outwith the customs union and the single market, which would make the hardest of Irish borders inevitable. But, partly because of Corbyn’s consequent inability to mobilise the Remain voters Labour would need to displace the Tories from power anytime soon, it is the Brexit ideologues who are now finding Ireland a troubling source of cognitive dissonance. Anyone who really wants to know what is going on with Brexit should read the Irish Times, which clearly reports the view in Brussels that it is impossible to turn into legal text the EU’s outline agreement in December with May—almost scuppered at the time by the DUP. This is because the deal not only implies maintenance of a soft border in Ireland but also a consequent regulatory ‘alignment’ between the two parts of the island. Since, to keep the DUP onside at Westminster, the agreement also blocks the obvious solution of a new, de facto, EU/non-EU border down the Irish Sea, while retaining a soft (UK-Irish) border in Ireland, the alternative reduces to the whole of the UK remaining in the single market and the customs union—the softest of Brexits, which would solve all the associated economic problems but would ‘give back control’ to the remaining EU 27 over the rules a post-Brexit UK would follow. That this should cause much political thrashing around among the Brexiters is hardly surprising. And they have picked up on a call in an article in the conservative Daily Telegraph by Ruth Dudley Edwards, a senior Irish commentator who has long focused on the north, for an ‘updating’ of the Belfast agreement—given its ‘unintended consequence of enshrining sectarianism in the political process’—into making the accord their whipping boy. It was, after all, the agreement, with its institutionalisation of north-south co-operation in Ireland and associated dismantling of the repressive apparatus of military border control, which rendered the Irish border invisible in the first place. The DUP was always opposed to the agreement—mainly because of the at-root theological reluctance of its evangelical-Protestant core support to share power with Catholics. It ensured that when devolution was renewed in 2007, after an hiatus from 2002, it was on amended terms which the former head of the Community Relations Council in Northern Ireland, Duncan Morrow, called ‘sharing power out’. So who is the DUP? Cas Mudde’s authoritative Populist Radical Right Parties in Europe defines this political family as comprising parties that are ‘nativist’ (nationalistic and xenophobic), authoritarian and, of course, populist. So he includes the DUP in the radical-right family, noting that it is fundamentalist to boot. Sinn Féin he places just outside: it is, yes, nationalistic, authoritarian and populist too, but ‘only’ xenophobic towards the British and Protestants. Now, with Owen Paterson, a former Conservative Northern Ireland secretary, Kate Hoey, a Labour Leave MP originally from Northern Ireland, and Daniel Hannan, a Tory MEP, all casting doubt on the Belfast agreement, their opponents, including Owen Smith, Labour’s recently appointed shadow on Northern Ireland, Keir Starmer, its shadow on Brexit, and John Harris, a Guardian commentator on the left, have all felt obliged to rise to the agreement’s defence, in what has become a noisy but likely ephemeral Twitter storm. On its own terms, however, this doesn’t make a lot of sense. It feels like individuals on the liberal left whose knowledge of matters Irish may also be limited are weighing in regardless. As its 20th anniversary looms within weeks, after all, the agreement is not functioning, with neither the Northern Ireland assembly and executive nor the North-South Ministerial Council in being. The reasons why the rest of the Good Friday Agreement institutions are not functioning have by now been well established. In political-science terms, it is a matter of agents and structures. As for the agents, a South African expert on dealing with violent legacies, who now lives in Northern Ireland, points out in the Irish Times how the region has failed to see the transition to inspiring leadership marked by his native country’s elevation of Cyril Ramaphosa as president after the disastrously corrupt rule of Jacob Zuma. Bizarrely, it was the one-time anti-apartheid radical, Peter Hain, who as Labour Northern Ireland secretary introduced the DUP to power at Stormont in 2007, by accepting amendments to the post-agreement legislation ensuring it could veto propositions advanced by Sinn Féin which it did not like. This referred back to an attempt in 2002 by the then Sinn Féin education minister, the late Martin McGuinness, to end Northern Ireland’s uniquely antiquated (in Europe) system of academic selection at 11. Latterly, the DUP has similarly blocked SF’s demand for an act to promote the Irish language, predominantly spoken by Catholics (though in no case as mother tongue)—hence the latest, prolonged impasse. As for structures, the agreement ensured Northern Ireland’s sectarian politics would be set in aspic by requiring newly elected assembly members to designate themselves as ‘unionist’ or ‘nationalist’. The correlation between religion of family origin and euphemistic political cover is about as exact as any in social science: only one Catholic and one Protestant among the hundreds of members elected since 1999, to my knowledge, has not designated themselves in a way entirely predictable from their accident of birth. Those declining so to do—members of the non-sectarian Alliance and Green parties—are consequently marginalised: a ‘petition of concern’ raised by 30 members can ensure any motion requires ‘cross-community support’, which has been taken to mean concurrent majorities of soi-disant ‘unionists’ and ‘nationalists’. This clearly retards the emergence of not only the left-right political axis on which a normal European society is based but also of a liberal pole to counterbalance the embedded authoritarianism of Northern Ireland’s political culture—particularly in terms of feminism and a generally more open and tolerant society. The DUP has abused the petition of concern repeatedly to ensure that the region remains unique in the UK and Ireland in denying marriage equality to gay and lesbian individuals. There were many claims at the time of its promulgation, principally by the then US president, Bill Clinton, that the Good Friday agreement would be a template for divided societies across the world. Yet actually it has just made Northern Ireland remain similarly abnormal to Bosnia-Hercegovina and Lebanon, with backward-looking constitutional arrangements entrenching ethnicity and so governmental dysfunctionality. In political-science terms, the agreement harked back to the ‘pluralist’ theory of democracy from 1960s America, as applied to divided societies by ‘consociationalist’ thinking in the 70s: political blocs were thus taken as given aggregates, and ethnic elites were allocated the role of private deal-makers. Today, by contrast, there is a broad recognition in the academic literature that democratic societies are necessarily individualist, that constitutional arrangements need to be impartial and that political solutions should be arrived at through public deliberation. In that context, rising to the defence of the Belfast agreement will, unfortunately, take Northern Ireland and its citizens no closer to the normality that few would have thought would take so long to emerge two decades on from 1998. The Brexit mess, however, does illuminate why the British state’s role has proved so inept over those decades—never mind the prior ‘troubled’ years in which its forces were so deeply implicated. Whether it is regarding Belfast or Brussels, the dominant view from London has been that of the English gentleman amateur, who it is assumed will somehow muddle through, without having to detain himself too much with the detail, deploying some ‘creative ambiguity’ en route. The Brexit engagement with EU officials has, however, brought some up short. Britain’s liberal left has betrayed the same ‘Do we still have Northern Ireland?’ disposition over the years, no more aware of the close-textured arguments about ‘constitutional engineering’ resolution of the region’s complex task of conciliation requires. Meanwhile, with honourable exceptions, it has also absented itself from European-wide progressive networks, such as those established by the social-democratic Friedrich Ebert Stiftung and the Foundation for European Progressive Studies. And the best thing it can do now to stem Northern Ireland’s chronic sectarian polarisation—never mind haemorrhaging jobs in engineering and construction, as business confidence weakens—is not to rise in reflex to defend the inoperative Belfast agreement. It’s to stop Brexit.